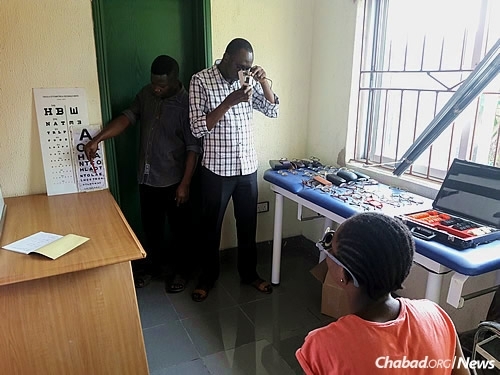 Hundreds of Nigerian children now have their first pair of glasses, thanks in part to a rabbinical student, a New York City opticians and Chabad of Nigeria. For years, Mendy Sternbach would visit Cohen’s Fashion Optical in Manhattan each Friday to wish employees Shabbat Shalom and put tefillin on with some of the staff. One week, he mentioned that he was going to Nigeria to help with Jewish programming for an upcoming holiday. “The store manager said that he had a big box of old donated glasses and asked if I had any use for them in Nigeria,” says Sternbach. “Realizing the potential, we discussed some of the practical aspects of glasses, like getting the children checked by an ophthalmologist and how to best to fit second-hand glasses. 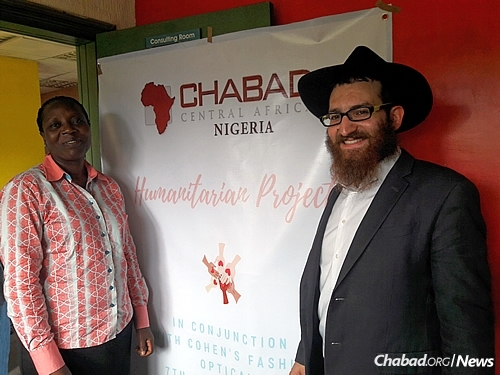 That’s when the vital work of Rabbi Israel and Haya Uzan, co-directors of Chabad of Nigeria, came into play. Living in the most populous country in Africa where more than 70% of people live on less than 80p a day they knew there was a definite need for the glasses. The glasses distribution program is just one of several humanitarian projects the Uzans have undertaken since establishing their Chabad House in 2013, part of the extended network begun by Chabad Lubavitch of Central Africa, overseen by Rabbi Shlomo and Miriam Bentolila. Uzan estimates that they donated a total of 300 pairs of glasses and plan to give away more thanks to the partnership with Cohen’s Fashion Optical, which continues to collect used eyeglasses from other outlets as well.